In the time since I picked up my XPS 15 9550 and TB15, Dell has introduced a new USB C docking station, the Dell Dock WD15 (450-AEUO). It appears that this dock has officially replaced the TB15. The product page for the TB15 is no longer available, searching for “TB15” brings up the wireless dock and the WD15, and on the XPS15 page the TP15 is listed as “Currently not available”. Additionally, from some quite harsh reviews, it appears Dell had some issues with reliability and drivers for the TB15. The WD15 uses USB C interface rather than Thunderbolt 3. Physically, the connector looks the same (Thunderbolt 3 uses the USB C connector). As a consequence, the WD15 is more likely to work with a larger assortment of devices. An interesting experiment would be to attempt to connect it to a smartphone with a USB C port that supports VESA DisplayPort Alternate Mode. Since the WD15 does not use Thunderbolt 3, it does not have the bandwidth to drive two 4k displays like the TD15—the WD15 is limited to driving two 1920×1200 displays. However, it still maintains the capability of powering the device plugged into it via the USB C cable. Port wise, the WD15 and TB15 are very similar. 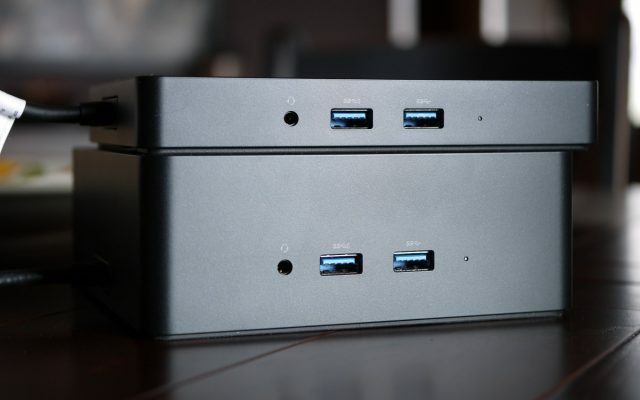 The WD15 is only missing the Thunderbolt 3 daisy chain port and the full size DisplayPort. Size wise, the WD15 is much more manageable than the TB15. It is less then half the height of the TB15, and is not nearly as deep. However, it is slightly longer, making it rectangular when looking at it from above instead of square. While the TB16 is the successor for the TB15, when this article was written, the TB16 had not been announced or released. Additionally, at the time, the TB15 had been pulled from market for several months. Thus, at the time of writing, the WD15 was the only replacement for the TB15.